The Sopranos prequel, The Many Saints of Newark, just added Jon Bernthal and Vera Farmiga to its cast. The news comes after the 20th anniversary of the hit HBO show, which took place last week and helped renew interest in the series. Viewership on HBO Go and HBO Now was up 70% from where it was in 2018 and many attribute that bump to the 20th anniversary interviews that were released last week. Now, excitement is about to ramp up for the prequel, which is currently in the casting phase of development. 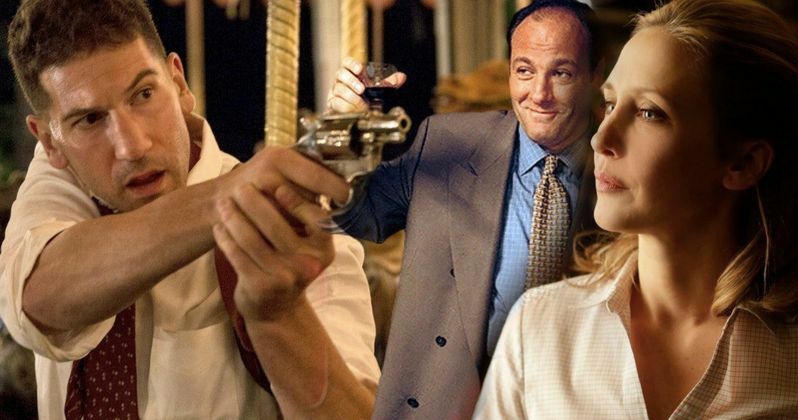 While Jon Bernthal and Vera Farmiga have joined the cast of the Sopranos prequel, it is unclear who they are playing. They are joining Alessandro Nivola, who stars as Dickie Moltisanti (Christopher's father). All other information about the prequel is being kept under wraps, but we know that it takes place in the era of the Newark riots in the 60s, which is when racial tensions between African-Americans and Italians was at an all-time high. Other than that, the prequel is a mystery as far as the story is concerned. In addition to Dickie Moltisanti, The Sopranos prequel will feature other characters from the hit series, including a young Tony Soprano. Moltisanti is Christopher's father, but he was also a mentor to the young Tony Soprano when he was a child. Series creator David Chase says that the prequel will show Newark at a time when Soprano was a boy and how that era affected him. It will also show those racial tensions at a time when the mafia was very polished and had its act together. David Chase admitted last week that he was initially not interested in making a Sopranos movie, especially after James Gandolfini's death in 2013. But, the idea of a prequel had been around for a while, and once Chase got to thinking about his own history in Newark (both of his parents are from there), he started to connect the dots and the idea seemed clearer. However, he admits that he's still a little unsure of the prequel, even though Sopranos fans are very excited to see what he and the crew have cooked up. Aside from being a prequel, Chase says that the movie is going to show a much different version of the mafia from what we have previously seen from the show. Alan Taylor is directing The Many Saints of Newark from a script by Sopranos creator David Chase and Lawrence Konner. Jon Bernthal recently wrapped filming on the second season of Netflix's The Punisher, which premieres on the streaming platform at the end of this week. As for Vera Farmiga, she recently starred with Hugh Jackman in The Front Runner, and will be seen next in the upcoming Godzilla: King of the Monsters. The Sopranos prequel casting news was first reported by Variety.